In the unlikely event that you do not see any dolphins on your tour, you will be invited to go out again on another ride at a discounted rate of $50 per participant. Refunds are not available. $50 rescheduling fee to be paid for each participant (both child and adult). Cruise 40 miles round-trip along the stunning Waianae coastline as you spot spectacular marine life. Hawaii's waters are home to dolphins, green sea turtles, flying fish and even humpback whales that visit during the winter! After snorkeling, take part in a sumptuous lunch buffet while sipping on a tropical Mai Tai, a cold beer, or any other refreshing beverage served on board. Let the cool Hawaiian breezes relax you as you make your way down the coast on this amazing day at sea! Perfect for guests staying in the Ko Olina area, including Disney Aulani, Marriott Beach Club and Four Seasons. Pro-tip! You're more likely to see dolphins on the Morning Calm Cruise, so get up early! You can book a maximum of 49. Enjoy the calm waters of the west coast of Oahu on this early morning dolphin watching cruise! Watch as the pods of Hawaiian Spinner Dolphins make their way back from their evening excursions and swim happily around the catamaran. A great choice for early birds to experience dolphins and snorkeling! Enjoy sightseeing, dolphin watching, and snorkeling on Oahu's west side! Tour includes a 1 hour snorkel starting at 9:15 followed by meal and bar service starting at 10:15. From Waikiki (28mi, 50-55min): Head WEST on the H1 Freeway. Once the H1 turns into a two lane highway (Hwy 93), you are approximately 3 miles away from the Ko Olina exit. After entering Ko Olina Resort, proceed to the marina located next to Lagoon 4. Park at the Ko Olina Marina Activity Center (beige colored building) to check-in. Parking is $10.00 with validation. 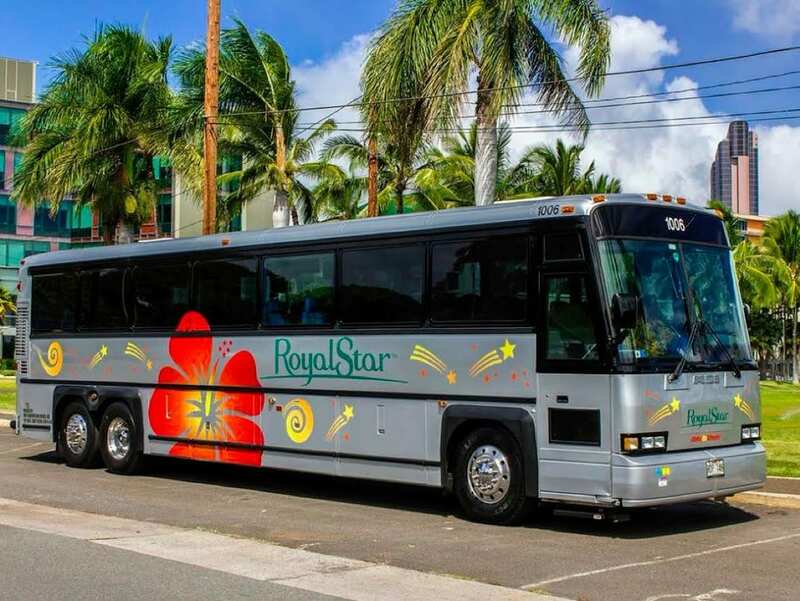 If you've arranged for transportation, please look for a Royal Star Silver bus. Waianae coast, where the Hawaiian sea life plays. Embark on a fun-filled snorkel and dolphin watching expedition along the west coast of Oahu on an afternoon sailing cruise. Watch as the pods of Hawaiian Spinner Dolphins frolic and swim happily around the catamaran before they head out for their evening foraging in the deeper waters. A fantastic choice for anyone wanting to have an aquatic Hawaiian adventure! Enjoy sightseeing, dolphin watching, and snorkeling on Oahu's west side! Tour includes a 1 hour snorkel starting at 13:30 followed by meal and bar service starting at 14:30. This is a barefoot tour (shoes will be stored dockside for your convenience). No, Ocean Joy Cruises is a certified Dolphin Smart operator, meaning they adhere to strict guidelines for responsible viewing of dolphins. They do not interfere with dolphin's behavior in their natural habitat. If you want to snorkel, some swimming ability is good for comfort and safety. However, many non-swimming participants in the past were happy to utilize their snorkeling vests to keep them buoyant. The crew is more than happy to assist beginners. No, life jackets are not required to be worn but they are available throughout the boat in case of emergency. The Kai 'Oli 'Oli is a custom-built 49 passenger, 61 foot power catamaran touring yacht with two 490 horsepower Diesel Caterpillar engines. It is one of Hawaii's newest, fastest, and most state-of-the-art custom catamarans in its class. It has the highest US Coast Guard safety rating for any boat in Hawaii and equipped with large bathroom/changing rooms, comfortable seating, four outdoor warm water showers, giant swim steps, and a modern audio and video system. What is on the lunch menu? Lunch includes Hawaiian-style Teriyaki Chicken, Kalua Pig (pulled pork), Lettuce and Tomato, and Fresh Hawaiian Buns, White Rice, Potato-Macaroni Salad, and Fresh Fruit. Complimentary beverages include Soft Drinks, Beer, Wine, Bloody Mary, Blue Kai, Mai Tai's and Margaritas. Are there photo services available? Yes, a photographer will be on hand to take photos of your trip! You can purchase a USB card that includes 150 or more high quality digital photographs that you can purchase for a fee of $40, payable directly upon check-out.